Please consider joining us for the Survivors in Motion Digital Storytelling Workshop! Please read the flyer and message below for more information. Since last year’s tornado outbreak, the OU Writing Center has been working to find a way to put our services to use in the recovery efforts. Our campus mission is to help students, faculty, and staff with a wide variety of writing projects. We also believe writing is a powerful tool to help heal people and communities beyond the campus. 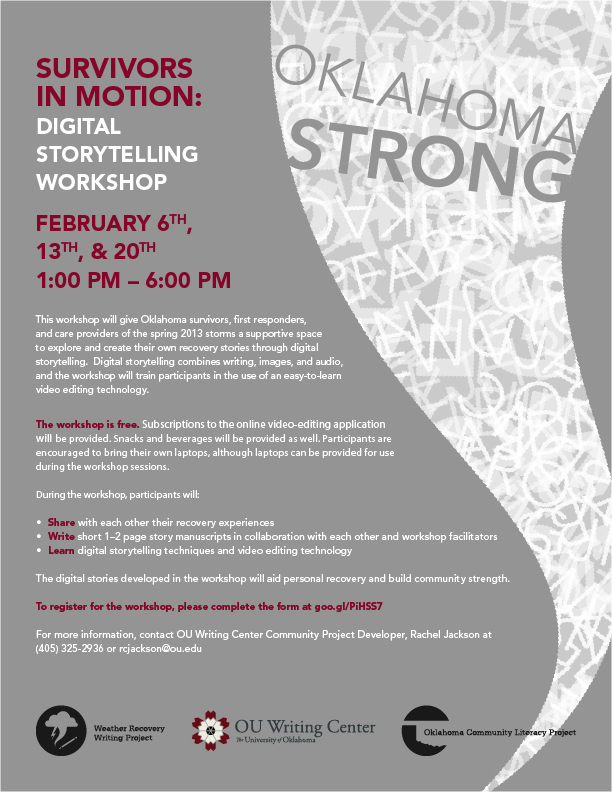 With guidance from the Center for Digital Storytelling (Berkeley, CA), we have developed a digital storytelling workshop for survivors, care givers, and first responders of the spring 2013 tornado season. We have offered our workshops last July and November, and they have been a great experience for everyone involved. Community members who participated each made fantastic stories about their recovery to share with friends, families, and others. Because of this success, we are happy to offer the workshop again this coming February. This workshop – called “Survivors in Motion” – is free and open to the public, and will be led by OU Writing Center staff. Sponsors include the OU Anne and Henry Zarrow College of Social Work and the OU College of Architecture, Division of Regional and City Planning. Minors over the age of 16 can participate with permission of a parent or guardian. Digital storytelling combines words, images, video, and sound to tell a story and convey a message. At the end of the workshop, participants will have a 3-to-4 minute video to share with others as they wish. We hope the digital stories participants create in this workshop will illustrate recovery and convey strength. It will be a space for participants to tell their stories. The workshop will be held three Fridays in a row, February 6th, February 13th, and February 20th, from 1:00 – 6:00 p.m. at the Moore Library (225 S. Howard Ave.). Snacks and beverages will be provided. Participants will be provided a user account for a web-based video-editing software they will use to create their digital stories. Participants are asked to bring their own laptops or tablets. A limited amount of laptops will be available for those who cannot bring their own. Participants can register for the workshop by filling out the registration form here. Please read the flyer below for more information about the workshop, and please help spread the word to others who would benefit from the workshop. Please feel free to contact me, Rachel Jackson, Community Project Developer, OU Writing Center, with any questions – (405) 325-2936 or (405) 205-6048, or at rcjackson@ou.edu.